John Kearney was asked to design the Mermaid dinghy for Dublin Bay Sailing Club in the 1930s although the class did not grow in Skerries until after the war when a group of members built what have since become known as the “Barkyard Boats” after the site where they were built. 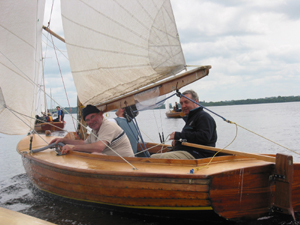 Some of those boats are still sailing and the tradition of members building these craft still survives. Construction is no simple matter. The boats are built according to the clinker method in a style which harks back to the Vikings. The end-product is a thing of beauty, however, which no modern design can match. The Mermaid has superb sailing qualities and a heavy metal centreplate provides a stiffness even in challenging conditions. In terms of numbers, the Mermaid is one of the largest classes raced in Skerries and this sailing club is the largest Mermaid club in Ireland. The boats are also sailed in nearby Rush, in Wexford and Dun Laoghaire.